There is a peacefulness at Christ Church, in the English town of Esher, despite the increasing hubbub of normal life going on all around. In the churchyard, sheltered beneath the trees on the eastern side, lie Rhodes Hawtyn Cobb and his wife Florence Harriet. Close by is Elizabeth Cobb, the first wife of John Rhodes Cobb, who was possibly the least likely looking of all the kings of speed. Here, too, they buried the great man, yet for him there is no carved headstone, as if even in death he craved the anonymity that was so comforting to him in life. If you head south from Inverness on the A82(T) along the north western shore of Scotland's Loch Ness, and before you reach the sleepy village of Drumnadrochit near Urquhart Bay, there is a stone cairn to the left of the road. It overlooks the measured mile upon which Cobb perished during his gallant attempt on the water speed record on September 29 1952. That was a momentous year in postwar Britain. King George VI had passed away, and test pilot John Derry's dramatic De Havilland DH110 had crashed horribly at the Farnborough Air Show. Britain had first exploded its atomic bomb. A young criminal called Christopher Craig shot a PC Sidney Miles in a rooftop incident in Croydon, and his older partner Derek Bentley, though not part of the shooting and troubled by learning difficulties, was subsequently hanged. There were floods in Lynmouth on the south coast, and a train crash in Harrow, too. I came into the world that year, too, six weeks prematurely, an event momentous perhaps only for my parents. Had my mother gone full term I'd have been a 1953 baby and the link I have always felt with Cobb would not have existed. I found out at an early stage of an obsession with speed that we shared the same birth date: December 2. Somehow, that strengthened the affinity I felt. Parry Thomas and Sir Henry Segrave had their contemporary fame, and the Campbell name is an indelible part of the fabric of Britain's record breaking heritage, but notoriety was complete anathema to Cobb. He was a shy bearlike man who made his money from the fur business and was quite prepared to spend it in the defence of national glory, but he wasn't about to tell anyone what he was doing. He was big, like the machinery he drove so well, and he was unflappable. Little is ever known to have upset his urbanity. 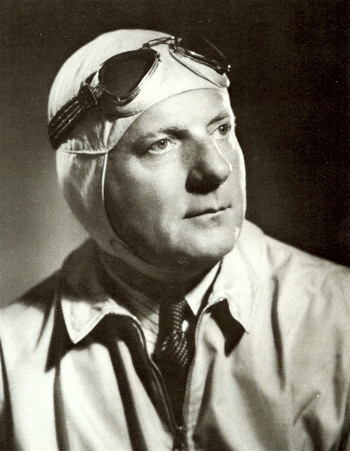 But where Sir Malcolm Campbell sought the spotlight, John Cobb was a reluctant hero. Because of that - and most unfairly - his greatest deeds tended to be eclipsed by his dapper rival's. Yet they too were mighty. Cobb used the Napier Railton to win the BRDC's 500 mile race in 1935 and the 500 kms in 1937, once held every world speed mark from one to 24 hours with it at venues such as Montlhery near Paris and Bonneville in Utah, and used it to set the Outer Circuit lap four times at Brooklands. Then he commissioned the brilliant Reid Railton to design him a car with which to break his friend George Eyston's 312 mph Land Speed Record. Where both Campbell and Eyston had access to the markedly more powerful Rolls-Royce R type engines, Cobb and Railton had to make do with Napier Lions dating back to 1929. They came from the speedboat Estelle, owned by the reclusive millionairess Marion `Betty' Carstairs of Harmsworth Trophy fame, who died in January 1994. Railton's greatest weapon was his own genius. He conceived an S-shaped backbone chassis, and located a Lion into each curve of the letter. The port engine drove the front wheels, the starboard the rears, and to that four-wheel drive set up he matched enviably light weight and a brilliantly aerodynamic envelope. Indeed, the smooth aluminium shell lifted off completely, to allow access to the machinery. Eyston's Thunderbolt behemoth weighed nearly 16000 lbs originally for its 73 litres and near 5000 bhp output, whereas the Railton only disturbed the scales up to 8000 lbs, and its 47.8 litres yielded 2500 bhp. Its frontal area was dramatically smaller too. With typical humility Cobb named the streamliner after Railton, rather than himself. Cobb knew every nuance of the tyres from watching them closely during high-speed tests at Fort Dunlop, and knew he had to avoid wheelspin at all costs while at the same time accelerating quickly enough to make full use of the available track. None of his land speed records - 350.20 in 1938, 369.70 in '39 and 394.19 mph in '47 - was simply a matter of planting his right foot and holding the steering wheel for the sake of appearances. He developed an almost telepathic ability to sense just what state his rubber was in at each mile, and such hyper-alertness was vital since he sat so far forward in the remote cockpit of a car that was 28 feet long and had no tail fin to counter any tendency to yaw. He once likened his attempt on the Brooklands lap record to: "Seeing how far one could lean out of a window without falling out, and therefore somewhat risky," but the land record was no sinecure, either. He was the perfect development driver, a true prototype for today's technocrats. He bonded perfectly with the genius of Railton and engineers Kenneth Thomson and Ken Taylor of Brooklands' famed Thompson & Taylor enterprise, and could relate to them precisely what his vehicles were doing at any given speed. His feedback was devoid of embellishment and refreshingly honest, although he was not averse to trying to devise a means of resetting the rev telltale that Taylor rigged up for the 1947 attempt on the record, should he inadvertently exceed it! If he felt fear, it was something he controlled well behind that phlegmatic exterior. He once admitted that driving Parry Thomas' Babs round Brooklands was "horrible," but there were some who believed he was more afraid of upsetting his beloved mother than he was of the possible consequences of his high-speed calling. He accepted the risks with fatalism. He was officially the first man to travel at 400 when he achieved 403.1 mph one-way during his final run in the Railton, and genuinely believed that it could have broken the 400 mph barrier officially, had bad salt not hampered its progress. Yet he received no knighthood, and was not lionised everywhere he went, as Segrave and Malcolm Campbell had been. When he returned to Southampton on that occasion, there was no ticker-tape welcome. Even local dignitaries did not turn out to greet him. But the lack of recognition troubled him not at all. For all his years, attention embarrassed him. He was far happier on the desolate wastes of Bonneville, alone with his trusted aides and his own thoughts, ready to face whatever challenge was there to be conquered by equable temperament and underrated talent. It was rare for John Cobb to say much, in public or in private, for he was a man of few words. He much preferred to let his deeds do the talking. He was even reluctant to discuss his business at fur brokers Anning, Chadwick & Kiver, where his directorship took him as far abroad as Russia and the United States. Yet for all that, people liked and respected him for the man he was. Contemporary newsreel shots would show him standing quietly in any gathering, arms usually clasped behind his back. In New York he was once presented with a watch. At the time such advertising gifts were not commonplace and, uncomfortable with it, he disposed of it to a friend who made a facetious reply when Cobb asked how much anyone would give him for it. Cobb not only accepted the low figure, but refused point blank to reclaim it when he later learned just how valuable the watch had been. Michael Radford, whose grandfather founded the Swift marque and who himself is Chairman of the Swift Club, remembers meeting Cobb on the occasions when he would visit his parents for lunch. "He and Vicki were their close friends, and as a schoolboy I was awed when the great man came to the house. "My father had a Ford dealership and was fascinated by cars, and Cobb used to bring a new Bentley, or a new Jaguar or Austin Healey - C Type prototypes, that sort of thing - and let Father take them out. He went to my sister's 21st at our house, four months before he died. "He taught my mother to make a dry Martini to set the palate up for good food. He taught her to make these marvellous American style Martinis. "I often wonder what he was like as a younger man. I always remember him as quiet and unassuming, shy. But I was just about 13, and you know how shy you are yourself at that age! It was like meeting a God among mortals. It was one of the great joys of my life; hero worship wasn't in it. To get round that Outer Circuit at Brooklands at the speed he did; what a man!" Cobb adored his mother and valued her opinion more than any other's. His friends perceived him to be a shy giant who was generally uneasy in the company of younger women, but he surprised them all when he married Elizabeth Mitchell-Smith just before his last Utah run in 1947. They felt desperately for him when only 14 months later she succumbed to Bright's Disease, the chronic inflammation of the kidneys. Cobb retreated into himself and kept his feelings bottled up for months afterwards. Then, in 1950, he married Vera Victoria Henderson and his old character was finally able to reassert itself. In later years Vicki lived alone in her elegant flat in Chelsea, and I learned of her whereabouts when preparing to write this article through one of those wonderful strokes of luck that come along every now and then. By sheer chance, it transpired that she lived 10 doors away from a friend of mine, now dead, called Tom Northey. He was formerly the public relations genius at Pirelli. After John's death Vicki had resumed an interest in interior decorating and travelled widely, before settling down there. She was an interesting and interested companion, happy to talk about travel and modern sport and possessed of an incisive knowledge of both. "I suppose that the money has brought about the current pressures and resultant controversies in racing," she said presciently, adding of her late husband: "John was nothing flash, like you might think a racing driver was going to be." I suggested that she had been instrumental in helping him to start to live again after Elizabeth's death, and she sparkled warmly. "It would be lovely to think so," she said quietly, and the eyes that held mine over the generous Manhattans she had poured us were so bright and alive. "John wasn't so much shy, as reserved," she continued. "And you're right; he was a reluctant hero. He never did want any publicity for anything that he did. You know, Sammy Davis always used to say that he'd ask John out for lunch to try and find something out about whatever he was up to. They'd have a wonderful meal, with lots of chat, but at the end of it Sammy admitted he was no wiser!" To a writer, reading between the lines of the former Bentley boy and Le Mans winner's biography of Cobb, The John Cobb Story, it is clear that even a writer as adroit as Davis (who worked for The Autocar when he stopped racing) was struggling to get him to say anything about himself! John Cobb, who liked his pre-prandial dry Martini and was also partial to whisky and soda, was a gentleman and a gentle man, who kept his own counsel. "Of course we spoke about things together," says Vicki, "but he wasn't a man for discussing his problems. I didn't know anything about the mechanical side of things, had no idea about engines, so there wasn't any point in talking about that. But he was a relaxed man in company that he knew, and he had a very special sense of humour with his friends." Frankie Sculthorp became close to the Cobbs in the early Fifties, and she still remembers John fondly. "He was not a man to talk about himself. He was very modest, and never sought publicity. He was a very private person. Delightful, fun, unpretentious - he was all of these adjectives. "He would be reserved when he first met people, but once he warmed to them he was great fun. And I never saw him angry. John wasn't the kind to show that, anyway. There are not many men like him around..."
He was vexed when petrol rationing after the war rendered him a pedestrian and those who were lucky enough to be motorists ignored him on zebra crossings. And one unknown militant during the General Strike of 1926 discovered what happened when John Rhodes Cobb suspended his normal imperturbability; he was felled by a single blow when he tried to attack Cobb as the big man drove a London bus... But only once is there any record of John Cobb showing any other kind of outward emotion, and that occurred at Bonneville after setting one of his land speed records when, believing himself to be alone, he yielded to the pressure of the moment and wept. To Sir Malcolm Campbell publicity was oxygen, but it didn't matter to Cobb. Some say there was a degree of needle between the two speed kings, and certainly John never quite forgave Campbell for the part he believed he had played in the sale of Brooklands. That added spice to his plans to go after the land speed record, and perhaps later Cobb's intent to demonstrate that a jet-engined boat could be made to work successfully after Campbell's dogged but fruitless efforts with the Goblin-powered Bluebird K4 in the last years of his life. There were numerous problems, as inevitably there would be with such untried technology, but twice early in September he unofficially exceeded Stan Sayres' best speed of 185 mph, achieved when Slo Mo Shun IV set its 178.497 mph record. On Monday, September 29, Cobb tried again. Oddly, he had told both his mother and Vicki that he had a premonition about the last run in Crusader. The unusual reverse three-pointer was constructed from birch ply and a stressed skin of double diagonal plywood, but the front planing point was aluminium. Constructor Peter Du Cane, of Vosper, had considered wood since he believed it to be inherently stronger, but finally opted for metal through convenience during manufacture. After the series of test runs there was clear evidence that the planing shoe was distorting. Du Cane formally offered to revise the craft at Vosper's expense, but Cobb believed that he was keeping a lot of people waiting. He, Railton and Eyston favoured continuing with care, and after a charged summit meeting at the Drumnadrochit Hotel it was decided to carry on. Cobb said he would keep his speed down, and the plan was to break Slo Mo's record, take Crusader south for suitable repairs, and then to try for 200. Even in such extremis, however, he was thoughtful enough to write a letter that absolved the uneasy Du Cane of any responsibility. His own fate was thus sealed. That morning Crusader was taken out early on to the black waters of the loch as the overnight wind had dropped, but then a light breeze sprang up. By noon, a little low in spirits, the team repaired for coffee in the lounge of the Drumnadrochit Hotel to discuss the next step. Then came word that the loch was flat once more, and hurriedly everyone departed again for their stations. The support boats had been left in position, but as Cobb returned to the loch he found the timekeepers' 40 ft boat Maureen returning to base against orders. He was annoyed by the wake it had created, but time was of the essence and he could not afford to wait any longer. Moments later John Cobb sped southwards at astonishing speed, but as he cleared the measured mile Crusader was seen to be porpoising dramatically. While conceiving Donald Campbell's Bluebird K7 turbojet hydroplane, designer Ken Norris would later analyse cine film recorded for 15 seconds immediately before and after the accident. Shot at 16 frames per second, its 248 frames revealed that Cobb was being pitched up and down through an 18 inch arc five times a second. When Crusader hit three ripples created by the errant Maureen's wake, the impacts were too much for the weakened front planing point. As it gave way, she buried her nose into the loch and exploded into fragments. Cobb was thrown 50 yards from the open cockpit, but was dead when help reached him. He had covered the measured mile in 17.4s, at an average speed of 206.89 mph and with a peak of a phenomenal 240. But, because he had not achieved a return run, no record could officially be ratified. Within an hour of John Cobb's death the wind had dropped altogether and the sombre loch was flat calm again, bathed in warm sunshine. Florence Cobb died in 1963 at the age of 96, but even today she is remembered in Esher for her kindness and generosity to the church. Her son inherited her values and the Highlanders respected the lengths to which he went to integrate the Crusader project as best he could into their established way of life. Vicki remembered: "He was a big man, but he was very gentle, very quiet and thoughtful of others." Unsurprisingly, he had an affinity with children. She added: "He was gentle and patient with them." She still has a small cardboard thank-you present that he was given by all the children of Drumnadrochit after he had shown them around Crusader. "It was Heaven for small boys, of course!" On September 28 Loch Ness had been blessed with precisely the right conditions required for a water speed record attempt - calm water and zero wind. But it was a Sunday, and he knew the store the Highlanders placed on the Sabbath and refused to offend his own sense of propriety by taking advantage of such fortune. He could have taken the record that day and changed the course of history, and a less morally committed man might have succumbed to the understandable temptation, but to have done anything else but stay ashore would never have been the way of John Rhodes Cobb, the record breakers' record breaker.